Abraham Lincoln was born to Thomas and Nancy Lincoln on February 12, 1809, in a log cabin on a farm in Hardin County, Kentucky. Two years later the family moved to a farm on Knob Creek. There, when there was no immediate work to be done, Abraham walked two miles to the schoolhouse, where he learned the basics of reading, writing, and arithmetic. When Abraham was seven, his father sold his lands and moved the family into the rugged wilderness of Indiana across the Ohio River. After spending a winter in a crude shack, the Lincolns began building a better home and clearing the land for planting. They were making progress when, in the summer of 1818, a terrible disease known as milk sickness struck the region. First it took the lives of Mrs. Lincoln's uncle and aunt, and then Nancy Hanks Lincoln herself died. Without Mrs. Lincoln the household began to fall apart, and much of the workload fell to Abraham and his sister. The next winter Abraham's father returned to Kentucky and brought back a second wife, Sarah Bush Johnson, a widow with three children. As time passed, the region where the Lincolns lived grew in population. Lincoln himself grew tall and strong, and his father often hired him out to work for neighbors. Meanwhile, Lincoln's father had again moved his family to a new home in Illinois, where he built a cabin on the Sangamon River. At the end of the first summer in Illinois, disease swept through the region and put the Lincolns on the move once again. This time it was to Coles County. Abraham, who was now a grown man, did not go along. Instead he moved to the growing town of New Salem, where he was placed in charge of a mill and store. Life in New Salem was a turning point for Lincoln, and the great man of history began to emerge. To the store came people of all kinds to talk and trade and to enjoy the stories told by this unique and popular man. The members of the New Salem Debating Society welcomed him, and Lincoln began to develop his skills as a passionate and persuasive speaker. When the Black Hawk War (1832) erupted between the United States and hostile Native Americans, the volunteers of the region quickly elected Lincoln to be their captain. outstanding lawyer in Springfield, Illinois, and soon took Lincoln under his care and inspired him to begin the study of law. Lincoln served four straight terms in the legislature and soon emerged as a party leader. Meanwhile, he mastered the law books he could buy or borrow. In September 1836 Lincoln began practicing law and played an important part in having the Illinois state capital moved from Vandalia to Springfield. In 1837 Lincoln himself moved to Springfield to become Stuart's law partner. He did not, however, forget politics. In 1846 Lincoln was elected to the U.S. Congress. During these years Lincoln had become engaged to Mary Todd (1818–1882), a cultured and well-educated Kentucky woman. They were married on November 2, 1842. When Congress met in December 1847, Lincoln expressed his disapproval with the Mexican War (1846–48), in which American and Mexican forces clashed over land in the Southwest. These views, together with his wish to abolish, or end, slavery in the District of Columbia, brought sharp criticism from the people back in Illinois. They believed Lincoln was "not a patriot" and had not correctly represented his state in Congress. Although the Whigs won the presidency in 1848, Lincoln could not even control the support in his own district. His political career seemed to be coming to a close just as it was beginning. His only reward for party service was an offer of the governorship of far-off Oregon, which he refused. Lincoln then returned to Illinois and resumed practicing law. During the next twelve years, while Lincoln rebuilt his legal career, the nation was becoming divided. While victory in the Mexican War added vast western territory to the United States, then came the issue of slavery in those new territories. To Southerners, the issue involved the security and rights of slavery everywhere. To Northerners, it was a matter of morals and justice. A national crisis soon developed. Only the efforts of Senators Henry Clay (1777–1852) and Daniel Webster (1782–1852) brought about the Compromise of 1850. With the compromise, a temporary truce was reached between the states favoring slavery and those opposed to it. The basic issues, however, were not eliminated. Four years later the struggle was reopened. Lincoln's passionate opposition to slavery was enough to draw him back into the world of politics. He had always viewed slavery as a "moral, social and political wrong" and looked forward to its eventual abolition. Although willing to let it alone for the present in the states where it existed, he would not see it extended one inch. At the same time, Illinois Senator Stephen A. Douglas (1813–1861) drafted the Kansas-Nebraska Act, which would leave the decision of slavery up to the new territories. Lincoln thought the bill ignored the growing Northern determination to rid the nation of slavery. Soon, in opposition to the expansion of slavery, the Republican party was born. When Douglas returned to Illinois to defend his position, Lincoln seized every opportunity to point out the weakness in it. Lincoln's failure to receive the nomination as senator in 1855 convinced him that the Whig party was dead. By summer 1856 he became a member of the new Republicans. Lincoln quickly emerged as the outstanding leader of the new party. At the party's first national convention in Philadelphia, Pennsylvania, he received 110 votes for vice president on the first ballot. Although he was not chosen, he had been recognized as an important national figure. National attention began turning toward the violence in Kansas and the Supreme Court decision in the Dred Scott case, which debated the issue of slavery in the new territories. Meanwhile, Douglas had returned to Illinois to wage his fight for reelection to the Senate. But unlike in earlier elections, Illinois had grown rapidly and the population majority had shifted from the southern part of the state to the central and northern areas. In these growing areas the Republican party had gained a growing popularity—as had Abraham Lincoln. As Lincoln challenged Douglas for his seat in the Senate, the two engaged in legendary debates. During the Lincoln-Douglas debates, Lincoln delivered his famous "house divided" speech, stating "A house divided against itself cannot stand. I believe the government cannot endure permanently half slave and half free." Lincoln proved his ability to hold his own against the man known as the "Little Giant." In the end Douglas was reelected as senator, but Lincoln had gained national attention and his name was soon mentioned for the presidency. In 1860 the Republican National Convention met and chose Lincoln as their candidate for president of the United States. With a divided Democratic party and the recent formation of the Constitutional Union party, Lincoln's election was certain. After Lincoln's election victory, parts of the country reacted harshly against the new president's stand on slavery. Seven Southern states then seceded, or withdrew, from the Union and formed the Confederate States of America. In his inaugural address he clarified his position on the national situation. Secession, he said, was wrong, and the Union could not legally be broken apart. He would not interfere with slavery in the states, but he would "hold, occupy, and possess" all property and places owned by the federal government. By now there was no avoiding the outbreak of the Civil War. From this time on, Lincoln's life was shaped by the problems and fortunes of civil war. As president, he was the head of all agencies in government and also acted as commander in chief, or supreme commander, of the armies. Lincoln was heavily criticized for early failures. Radicals in Congress were soon demanding a reorganization of his cabinet, or official advisors, and a new set of generals to lead his armies. To combat this, Lincoln himself studied military books. He correctly evaluated General Ulysses S. Grant (1822–1885) and General William T. Sherman (1820–1891) and the importance of the western campaign. Thanks, in part, to Lincoln's reshuffling of his military leaders, the Union forces would soon capture victory over the Confederates. 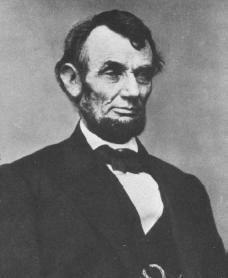 Afterward, Lincoln issued his Emancipation Proclamation. The proclamation called for the freeing of all slaves in territories still at war with the Union. Later, during his Gettysburg Address, he gave the war its universal meaning as a struggle to preserve a nation based on freedoms and dedicated to the idea "that all men are created equal." Lincoln was reelected in 1864. As the end of the Civil War appeared close, Lincoln urged his people "to bind up the nation's wounds" and create a just and lasting peace. But Lincoln would never be able enjoy the nation he had reunited. Five days after the Confederate army surrendered and ended the Civil War, Lincoln was shot by John Wilkes Booth at Ford's Theater in Washington, D.C., on April 14, 1965. The president died the next day. Although the reasons for Lincoln's assassination would be debated, his prominent place in American history has never been in doubt. His work to free the slaves earned him the honorable reputation as the Great Emancipator. His ability to hold together a country torn apart by civil war would forever secure his place as one of America's greatest presidents. Bruns, Roger. Abraham Lincoln. New York: Chelsea House, 1986. Jacobs, William Jay. Lincoln. New York: Scribner's, 1991. Judson, Karen. Abraham Lincoln. New York: Enslow, 1998. Miller, William Lee. Lincoln's Virtues: An Ethical Biography. New York: Alfred A. Knopf, 2002. Oates, Stephen B. With Malice Toward None: A Life of Abraham Lincoln. New York: HarperPerennial, 1994. Sandburg, Carl. Abraham Lincoln: The Prairie Years and the War Years. New York: Harcourt, Brace, 1954. Reprint, San Diego: Harcourt, Brace Jovanovich, 1982. He was a good president he helped stop slavery for a while we will all ways love him for what he did. Abraham Lincoln is a gift to all generations after him, though dead you still speak to as many ears that care to listen. You were endowed with wisdom that this generation rarely offer. The soundness of your mind allowed you pour the totality of your inherent treasure which gladdens our hearts any time we read. Such great mind will continue to live on, I love you Sir Lincoln. I wish to correct some facts in this biography of ABRAHAM LINCOLN. First of all, in the very beginning of this article it is stated that Lincoln passed away on April 14, 1865. Actually he passed away on the next day, April 15, 1865 at 7:22 A.M.
ABRAHAM LINCOLN became president of the U.S. at a time when democracy was in danger of failing. The U.S. was the only important democracy in the world, & if the SOUTH had won the war, then the country would would have two separate nations. No other countries would try to be democratic for fear of a civil war and then in the 20th century any strong dictator might try to wage war against a small weak U.S. without allies that were also democracies. Thank You. There is something very mystical about ABRAHAM LINCOLN'S life. The Gerttysburg Address starts off with "Four score and seven years." That's 87 years ago. He was assassinated in Box #7 in Ford's Theater.l He died at 7:22 A.M. the next day. He died in Washington, D.C. near Maryland, the 7th state to join the Union. There are exactly 7 letters in his first and last names. I believe that 8-7 is a date on which an important event will take place. from these facts, I deduce that there will be an EARTHQUAKE in San Francisco, California on Tuesday, August 7, 2012 at 9:41:27 PM PDT. Epicenter near Glen Canyon Park. Magnitude 4.4 Richter. Thank You. There are a couple of errors in the COMMENT by GABRIEL LEVY, that precedes this comment. The date should be Friday, August 7, 2015. The depth of shock should be 7.2 miles. Left-lateral Fault movement. Thank You.